HARMAN Professional has released the latest update to its live sound system configuration and control application software, JBL HiQnet Performance Manager. Version 1.6 features improved group muting controls and a new library cleanup tool, along with several other updates including the ability to save files with EQ in Line Array Calculator Tapering/Shading mode and open them in multiple arrays. 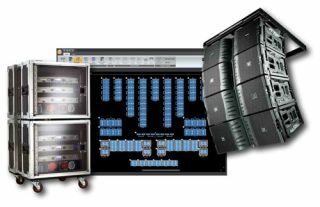 JBL HiQnet Performance Manager is designed to offer reduced design time, simplified networking, and automated control interface configuration in a workflow-based user experience for live performance installation professionals. Offered in version 1.6 is the new I-Tech 4x3500 HD firmware version 1042, an update for front display operation, a new array and ground stack Auto Amplify button to help guide automatic amplification of loudspeakers, and Group Muting and Signal Generator controls are now available in Test System mode. When selecting groups within the Group list, the affected loudspeakers are now highlighted in the main workspace to aid navigation. In addition, each Array or Ground Stack now has its own mute button to facilitate left/right testing, time alignment and tuning, as well as the ability to amplify speaker groups from the Configure Array dialog. Overall subwoofer array delay is now completely separate from individual subwoofer electronic delay steering (EDS) delays and the delay panels now show these as two separate values. This new feature allows for more sophisticated low frequency steering for either cardioid or front-firing subwoofer arrays while providing a more convenient interface for global system time alignment. The updated version also provides users with a new library cleanup tool, which helps to eliminate the accumulation of inadvertently large files for archived Custom Racks and Generic Speakers. A new “Clean” button has been added to both the Add Speakers and Add Amplifiers modes to remove custom racks and generic loudspeakers not in the current file from the disk library, as well as the file itself.